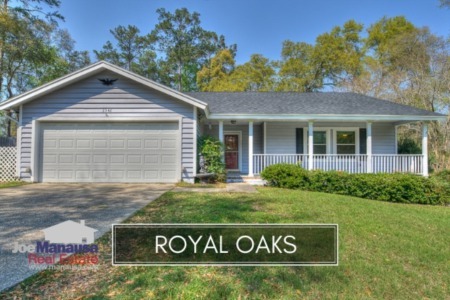 If you are looking to spend around $200,000 to live within the highly sought-after Thomasville Road corridor in Tallahassee, perhaps you should consider Royal Oaks. As the name suggests, you'll find majestic oak trees that hide larger than average homes. With home prices low and mortgage interest rates low, this might be the ideal time to move up to Royal Oaks without putting a big dent on your cost of living. 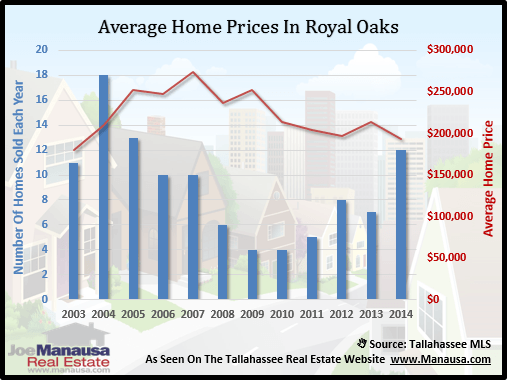 In this report, we will look at prices, values, and sizes of homes in Royal Oaks, as well as show current listings in the Tallahassee MLS and all closed home sales going back to 2002. For each of the three housing graphs found below, you will find the number of closed home sales for each year (blue columns, measured on the left vertical axis), and an important real estate statistic shown in red (measured on the right vertical axis. Home prices fell last year, after having risen nicely in 2013. In fact, the average recorded home sales price of $193,900 in 2014 established a new 11 year low. Fortunately, the 12 homes sold in 2014 was higher than all previous years going back to 2006 (a 9 year high!). 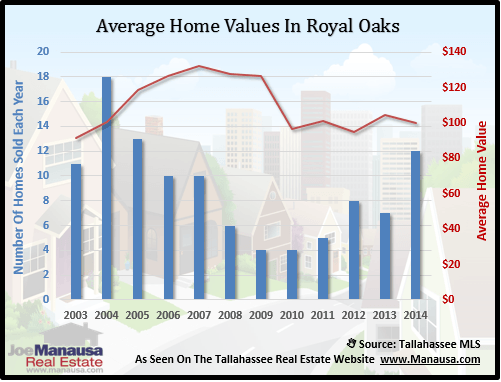 Average home values in Royal Oaks declined 4% in 2014, and are currently just marginally higher than the 11 year low established in 2012. 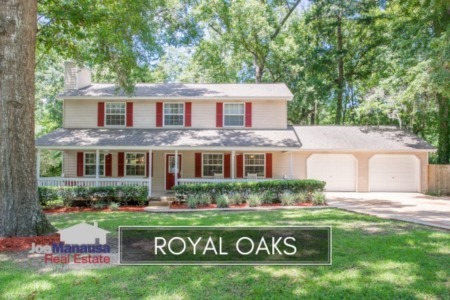 In 2014, the average value of a home sold in Royal Oaks was $100 per square foot. 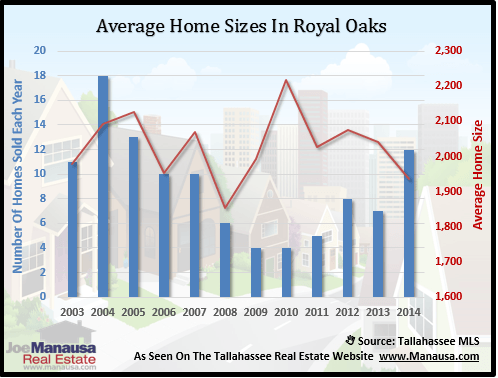 The average home size sold in Royal Oaks typically falls in a range of 1,900 to 2,200 square feet, and 2014 had buyers choosing the smaller homes. The 12 home sales in 2014 averaged 1,937 square feet, meaning buyers are choosing the smaller homes and better values. This explains the new ll year low on average home price, and I suspect we'll see this trend reverse in 2015. The following list of homes are the most recent listings in Royal Oaks. The following list shows home sales going back to 2002 in Royal Oaks. I hope you enjoyed our February 2015 update on home sales in Royal Oaks, please feel free to drop me a note if you have questions not covered in this report.